Ideal for use under wet and dry work environments. 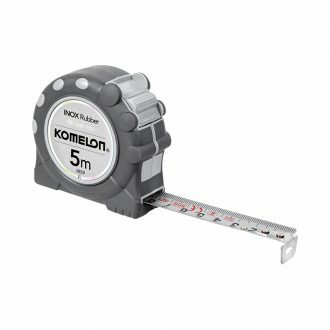 The Komelon 5m x 19mm INOX Rubber Stainless Steel Tape is perfect for use under wet and dry work environments such as sewage, harbour construction, marble masonry, tunnels and underground construction. The basic structure of the blade consists of a stainless steel construction, treated with an anti-rust phosphate surface treatment. The scale is a strong adherent baked/heathen painting coated with nylon and a tough embossed finish. The Komelon nylon coating is permanently bonded to the entire blade for its maximum protection. The blade is also a non-glare silver surface.